A. H. Mackmurdo. WREN"S CITY CHURCHES. G.Allen, Orpington 1883. An amazing book or at least an amazing title page (above) representing the first flowering of art nouveau in Britain and posssibly Europe, the only thing preceding it is thought to be some 'free flowing' wrought iron styles. Described thus in Rheims's Flowering of Art Nouveau “This title page is generally regarded as the first manifestation of Art Nouveau. It contains all the elements which were to emerge triumphant ten years later: broadly stylized flowers, undulating stems, leaves rising like flames, integration of the type design with the decoration, and an arresting distribution of black and white, giving the background a positive decorative value.”---Without the title page the book would be an unnoticed but useful work on the great Wren. Mackmurdo's infiuence on Continental Art Nouveau has also been recognised as seminal, especially through the curvilinear ornament of his title page for Wren's City Churches (1883), which echoes his chair-back of the previous year. Mackmurdo's architectural work, taken up again after 1888, included the Savoy Hotel (1889), a house in Chelsea for the artist, Mortimer Menpes with the most remarkable Japanese-style interior, and his own houses in Essex. 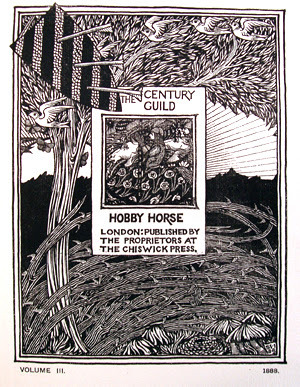 He edited with Herbert Horne The Century Guild Hobby Horse (1886- 1892. 28 issues) the key journal of the Arts and Crafts movement. Contributors include Selwyn Image, Ford Madox Brown, William Strang,G F Watts, W M & C G Rossetti, John Ruskin, E Burne-Jones, Oscar Wilde, J A Symonds, Mathew Arnold, J Todhunter, K Tynan, L Johnson, A Dobson, W S Blunt, A W Pollard, L Binyon, William Morris, G. F. Watts, John Ruskin,etc. I was told about the book by the legendary dealer/ runner Andrew Henderson a lanky figure often seen in auction rooms in the 70s and 80s. He had taught art and had impeccable taste when it came to books and would occasionaly sniff them heartily, possibly to detect mould. I was just looking through old ABPC records to see the kind of things he bought. A partial list would include - Blake, Ricketts, Beerbohm, William Nicholson, James Guthrie, Christopher Dresser, Repton, Inigo Jones, Eragny Press, James Joyce letters, Waugh, Francis Crease, Greene 'Bear Fell Free', Bomberg, Gimson, Gaudier Brzeska, William Allingham, the occasional Rackham and Henry Shaw. Although he was said to have a billionaire end user client he often took a while before he could drum up the money to clear his lots. He once caused gasps in the room by outbidding allcomers, including the phone, on an early 12 page Joyce letter ( apparently practically a mission statement.) He paid about £12,000 + commission which in the early 1980s would have got you a flat in Battersea. VALUE? There is a copy for sale with many unpleasant ex library traits at $1500 and it's the only one. Who was it who said that the enemies of books were fire, water, servants, children and librarians? I have had the book twice and seen it 6 or 7 times and our last copy was a large paper one - "One of an undesignated number of copies on large paper. (Taylor p. 34) A.P.C., inscribed on front blank: ‘John Frazer, from his friend the author. Arthur Mackmurdo. May, 1884.’ Sold in 1996 for £1400. Might be yesterday's book, however there hasn't been a decent copy around for about 8 years. In the late 90s ordinary copies made about £400 to £600 in terrestrial auctions. In 1987 a 'fine' copy was catalogued by Charles B Wood III at $1600. The book is, so far, unknown to ebay, although Mackmurdo's furniture is regularly traded there. Thank you for thig blog and the great links. If you like incunabulas, i think you would like the 6 ones i have on my blog too. not about that sort of incunabula Nemes man, read the blithering text!